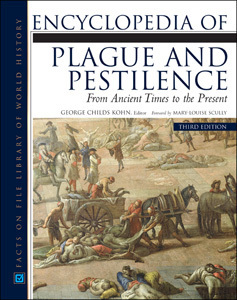 Tracing the history of infectious diseases from the Philistine plague of 11th century BCE to recent SARS and avian flu scares, Encyclopedia of Plague and Pestilence, Third Edition is a comprehensive A-to-Z reference offering international coverage of this timely and fascinating subject. This updated volume provides concise descriptions of more than 700 epidemics, listed alphabetically by location of the outbreak. Each detailed entry includes when and where a particular epidemic began, how and why it happened, whom it affected, how it spread and ran its course, and its outcome and significance. Black-and-white photographs have been added throughout. Black-and-white photographs and illustrations. Maps. Index. Appendixes. Bibliography. Cross-references. Chronology. Editor George Childs Kohn holds a B.A. from the University of Pennsylvania and an M.Ed. from the University of Hartford. He has developed and prepared general interest and historical reference books for more than 30 years. He has written and edited numerous reference works for Facts On File, including Dictionary of Historic Documents, Revised Edition and Dictionary of Wars, Third Edition. He has also helped to edit English-language dictionaries and has worked as managing editor of multivolume student encyclopedias. Foreword author Dr. Mary-Louise Scully, a specialist in infectious diseases, is director of the Travel and Tropical Medicine Center at the Sansum Clinic in Santa Barbara, California. "Libraries with extensive health collections will want to add this to their collections..."
"One of the best features of this book is the variety of appendixes...A comprehensive treatment that’s good for reports or general interest."